This document is the user manual for the CUBA Platform Workflow Subsystem. This manual is intended for developers who use the CUBA platform to create applications with business processes management functionality. It is assumed that the reader is familiar with the Developer's Manual, which is available at www.cuba-platform.com/manual. This manual, as well as other documentation on the CUBA platform, are available at www.cuba-platform.com/manual. If you have any suggestions for improving this manual, please contact Technical Support at www.cuba-platform.com/support/topics. When reporting errors in the documentation, please indicate the chapter number and include a small portion of the surrounding text to make the search easier. 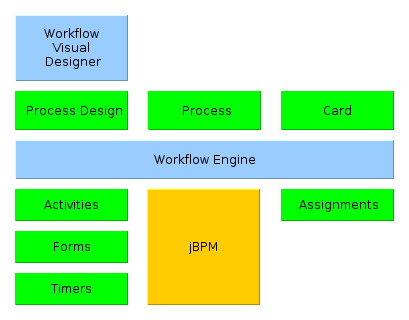 Workflow represents a series of changes to the state of a certain card entity in accordance with a specified process, which involves both users and automatic operations. A typical example is the process where a certain document is approved by employees in an organization. Below is the structure of the Workflow subsystem of the CUBA platform. Process Design - a process schema, as well as a collection of related scripts, variables, notification and message localization settings. The design defines the process, which is created and updated as a result of design deployment in the application. Process - an executable description of the business process. The execution mechanism is based on the jBPM 4 framework, so the main element of the process is the descriptor of the state graph in jPDL. Furthermore, the process includes descriptors of user interface forms, lists of users assigned to execute process roles, localized messages, etc. 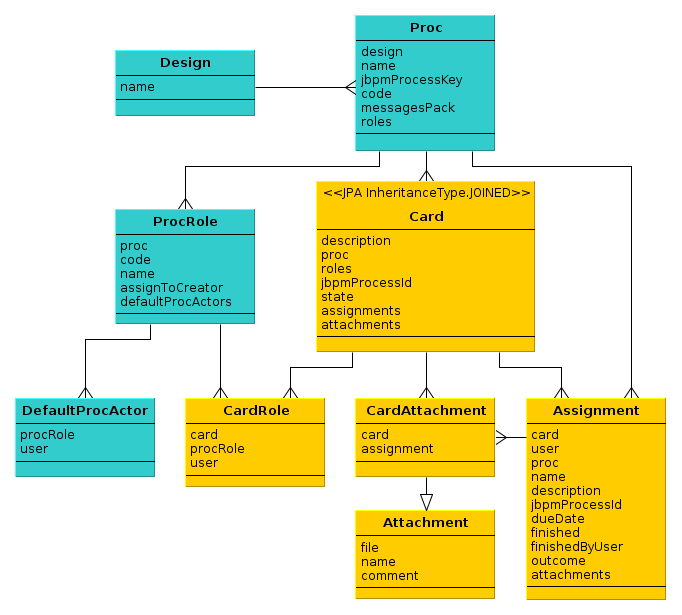 Card - a data model entity that is directly linked to the process instance. In most cases, the process card is a domain object with a state that may vary in accordance with the process. An example is a document awaiting approval or a ticket in the bug tracking system. If such a domain object does not exist, the card can be an artificial entity that simply reflects the current state of the process instance. In a manner of speaking, the process defines the type of business process, while the card represents a single instance of this business process. Activities - the software code that is executed when transitioning to a particular state. Forms - interactive screens that allow users to choose transitions. Timers - the software code that is automatically triggered when a certain amount of time has passed after entering a certain state. Assignment objects appear in course of process execution. They indicate that the user should take some action concerning the process. The Workflow subsystem of the platform has an integrated visual process editor, Visual Designer, which allows designing processes and deploying them at application runtime. The set of possible states, actions, forms, and timers that make up processes is configured in the application at the development stage. Below is the classes diagram of the main Workflow subsystem elements. Design - the object that stores the process design. design - link to the design that was used to create the process. name - the meaningful process name. The name is specified at the design stage. However, it can be set in the process editor screen as well. jbpmProcessKey - the process key in the jBPM execution engine. It is generated automatically when deploying the process design. code - the process code that can be referenced by software tools. Defaults to jbpmProcessKey, but can be changed in the process editor screen. messagesPack - the name of the messages pack that contains localized names of states and transitions, various descriptions and process messages. This package is generated automatically at the process design deployment stage and is stored along with other process files in the appropriate subdirectory of the application configuration directory. roles - list of ProcRole type objects that define the roles of process participants. ProcRole - a process role. Objects of this type are created automatically when the process design is deployed, if it contains Assignment states, which assign tasks to users and halt the execution of the process until the user takes required actions. Initially, ProcRole objects are not connected to any system users. However, you can assign a default holder for each role in the process editor screen. DefaultProcActor - list of holders of a certain role; this list is defined at the process level. description - an optional text description of a given card instance that allows the user to distinguish between cards without loading attributes of a particular type that extends the Card. For example, if the card represents a document, then it may be useful to enter the type, number, and date of this document in the description field. proc - the link to a process. roles - the list of CardRole type objects that define the process role holders for a given card. jbpmProcessId - the identifier of the process instance in the jBPM execution engine. state - the name of the current process state. assignments - the list of Assignment objects created in this process instance. attachments - the list of CardAttachment type objects that enable associating the files downloaded during process execution with the card. card - the card, for which the role holder is defined. procRole - the process role. user - the role holder of the User type (a system user). assignment - if the file is uploaded during the assignment stage, this attribute contains a link to the corresponding Assignment object. file - the uploaded file of the FileDescriptor type. name - the attachment name. comment - the comment on the attachment. user - the system user the assignment has been issued for. proc - the same process as the one set for the card at the moment of assignment creation. name - the assignment name. description - the assignment description. jbpmProcessId - the identifier of a jBPM process instance corresponding to the card executed at the time of assignment creation. dueDate - the assignment completion deadline. finished - the actual time when the assignment has been completed. Is null until the assignment is completed. finishedByUser - the user who has actually completed the assignment. Is null until the assignment is completed. outcome - the name of the assignment state outcome that the user has selected. For example, the business process schema may contain an assignment node that asks the user to check whether a particular bug has been addressed, and to select one of the two options to continue the process: "OK" or "Not OK". If the user chooses "OK", then this string is written to the outcome field of the assignment, and vice versa. attachments - the list of CardAttchment objects that were created for this assignment. In this chapter we will cover the use of the Workflow subsystem in the Library sample application which can be downloaded by means of CUBA Studio. An arbitrary system user creates an EBook object and specifies a publication for which an electronic version must be created. Then the scanning process begins. 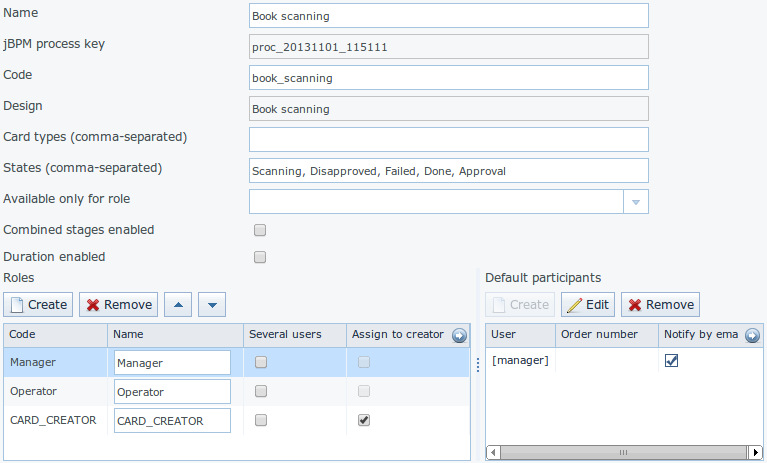 A user with the Manager role receives an assignment to approve or reject the book scanning. If the manager approves the scanning, the process continues to the next stage. Otherwise, the process finishes. After the manager approves this EBook, an assignment is created and sent to a user who has the Operator role. The operator digitizes the book and, if successful, attaches a file containing the electronic version of the book to the EBook. Done - scanning was successful and the object contains an attached file with the electronic version of the book. Not approved - scanning was not approved by the manager. Open the project properties window (Project properties -> Edit) and activate the workflow project in the Base projects projects list. Save the changes. Studio will prompt to recreate Gradle scripts. Choose "Yes". Choose Run -> Deploy. At this stage, the application will be built and deployed to the Tomcat application server located at build/tomcat. Create the application database: Run -> Create database. Launch the application server: Run -> Start application server. Open the application web interface at http://localhost:8080/app. Log in to the system by entering the username admin and password admin. The main menu should include the Workflow option that provides access to Workflow subsystem management screens. Choose Build -> Create IDEA project files in Studio and then open the project c:\work\library\library.ipr in IntelliJ IDEA. Let us create an EBook entity class that will represent the electronic version of the book publication. The Ebook class must be derived from the Card (process card) in order to manage the EBook state in accordance with the required business process. Parent class - Card [wf$Card]. The InheritanceType.JOINED inheritance strategy is defined for the Card class, thus EBook will be stored in a separate table, and its primary key will be an external key that references the Card primary key. This means that the CARD_TYPE field must store an integer value, which will be equal to 0 for base type instances. Therefore, it is sufficient to assign any value other than 0 for the EBook type. In the Primary key join column field, the CARD_ID name for the primary key of the created entity is automatically generated. In the Referenced primary key column field, the primary key for the WF_CARD table that stores the base Card entity is selected. In this case, it is ID. Next, let us create an entity attribute containing a link to the book publication. Mandatory - on. This means the attribute is required. Cardinality - MANY_TO_ONE. This means that several EBook instances can be created for one BookPublication instance. 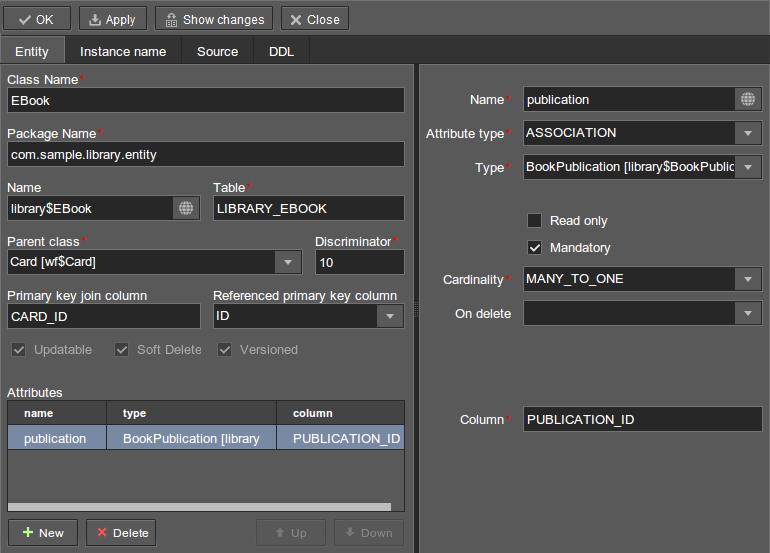 The Column field will contain the appropriate column name - PUBLICATION_ID. 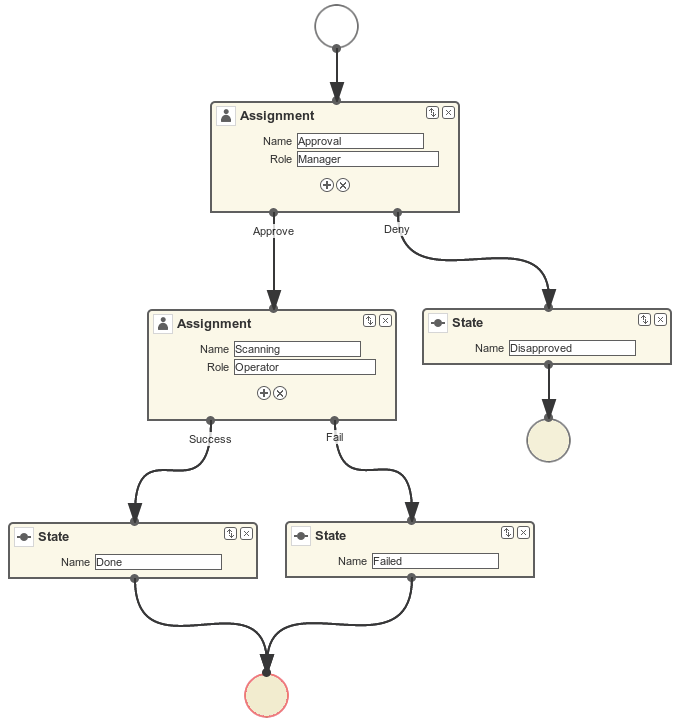 After the entity class is created, the Studio will report that the data model has been changed and now differs from the current database schema. It is necessary to generate the scripts and to start the database creation or update process. 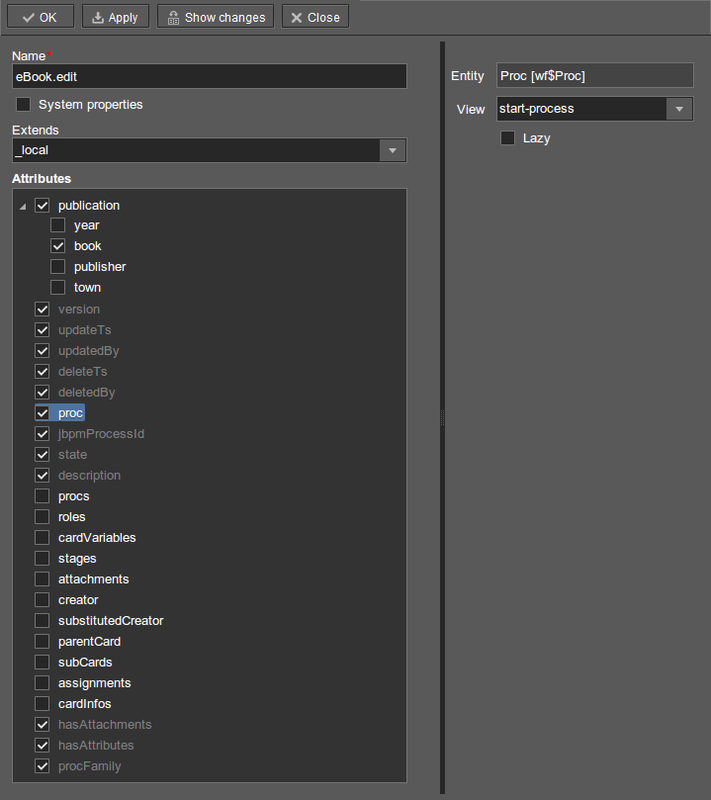 Click Generate DB scripts in the Entites section of the navigation panel. The Studio will generate the database update and initialization scripts, which include the creation of the LIBRARY_EBOOK table and its foreign keys. Since our database contains no data and can be easily recreated, you can safely delete the scripts in the Update scripts tab. After that, save the changes. Choose Run -> Stop application server to stop the application server. 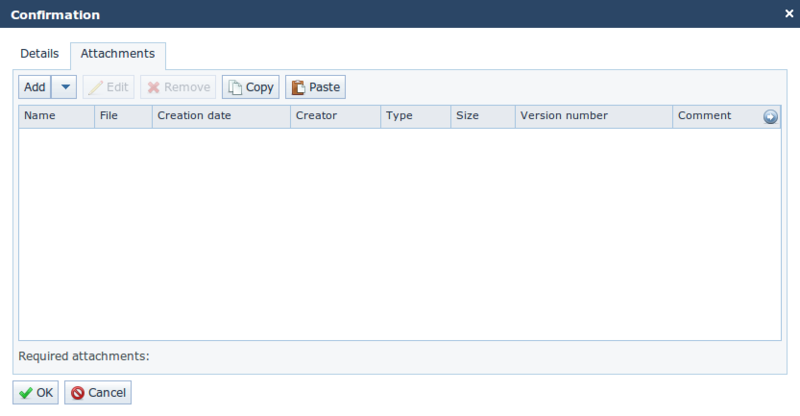 The Run -> Create database menu item, which should be used, will become available in a few seconds. Let us create the standard browser and editor for the EBook entity. To do this, we must first define views for these screens. Select EBook in the Entities section of the navigation panel and click New view. Set the view name in the Name field to eBook.browse. All local (non-reference) entity attributes in the Attributes panel are selected by default. Uncheck them all and select publication, which is the only attribute that we need at this stage. Since this attribute is a reference to the BookPublication entity, the tree displays the attributes of this entity. 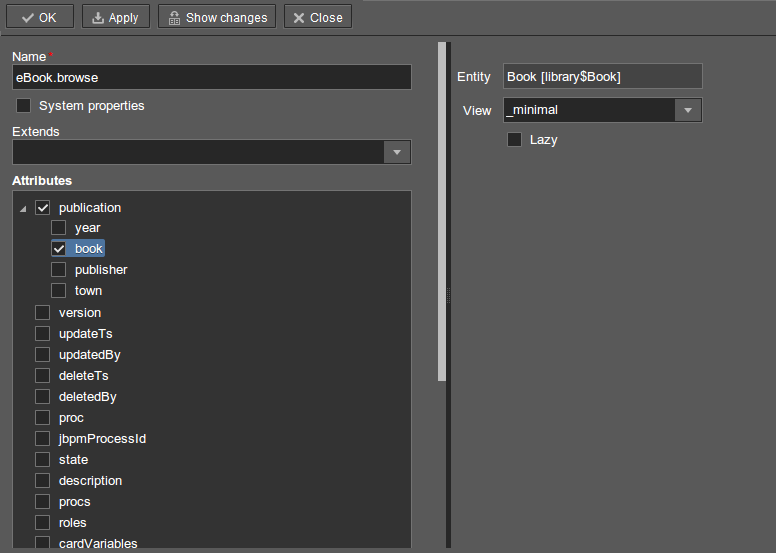 Check the book attribute, and select _minimal in the View field on the settings panel on the right. Save the changes. 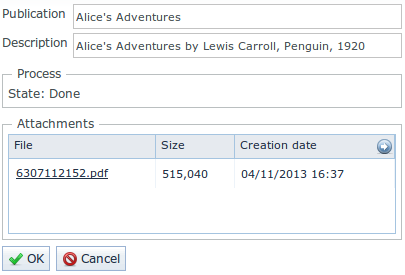 Similarly, let us create an eBook.edit view for the editor. At this stage, this view is identical to eBook.browse, but they will be different in the future. After creating the views, select EBook in the Entities section of the navigation panel once again and click Create standard screens. In the window that appears, select eBook.browse for Browse view, eBook.edit for Edit view, and click Create. The Studio will open the Screens section of the navigation panel and display the created screens. After creating the standard screens, you can launch the server (Run -> Start application server), log in to the application and make sure that the EBook entity is functional. Now, we can move on to the main part of the tutorial, which involves designing the business process and implementing the EBook objects processing in accordance with the business process. In this section, we will create a process design and then deploy it for execution. Open the Workflow -> Processes Design screen in the web interface of the running application and click Create. Enter the name of the process design, for example Book scanning, and click OK. A new CUBA Workflow Designer window will open. First, drag and drop the Start node onto the designer workspace. Then, drag and drop the Assignment node. Connect the Start node with the Assignment node input. Connect the Start output with the Assignment input. In the Assignment node, set the name to Approval and the role to Manager. Click the + button in the Assignment node to create an output and specify its name: Approve. Then, add another output: Deny. As a result, an assignment will be generated for a user with the Manager role when the running process transitions to the Approval state. The process will stop running until the user selects one of the outputs: Approve or Deny. If the manager rejects the process, it should transition to the Not approved state and finish. 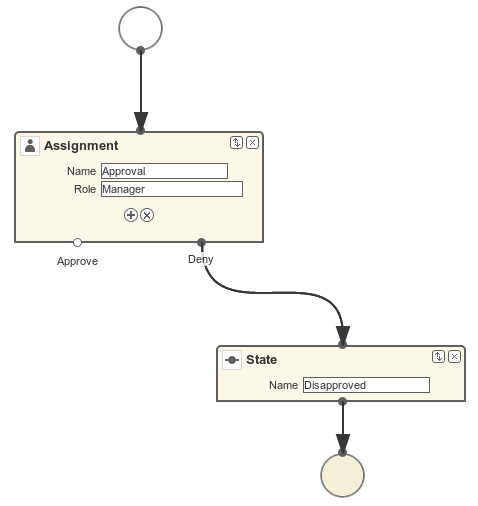 To register this state, add the State node with the name Not approved and connect its input to the Deny output in the Approval node. Then, add the End node and connect it with the output of the Not approved node. 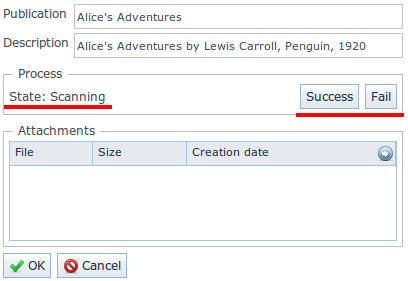 The running process will record the Not approved state in the card (an EBook instance) and finish without stopping. Click Save to save the current changes. Add another Assignment node, set its name to Scanning, and assign the Operator role to it. Add the Success and Fail outputs. Connect the Scanning input to the Approve output of the Approval node. As a result, when the process is approved by the manager at runtime, it will transition to the Scanning state, stop running and issue an assignment to a user with the Operator role. The process will resume running after the user completes the assignment by selecting one of the outputs. To register the final process state, add two State nodes, Done and Failed, and connect them to the appropriate Scanning output nodes. Then, add another End node and connect it to the Done and Failed node outputs. If the scanning is successful, the operator must attach the file with the electronic version of the book to the object. To implement this, we will add the form that will be used for interaction between the process and the user. Transition - the name of the output where the form will be shown. Select Success. Form - the type of the form. Select Transition. Hide Attachments - hide the components for attachment selection. Leave this box empty. Thus, if the assignment is completed with Success, a dialog form will be displayed, and the operator will be able to add the attachments, i.e. files with the scanned version of the book. Save the process design and close the CUBA Workflow Designer window. The created process design must be compiled. In other words, it is necessary to create scheme-based executable code for the process. 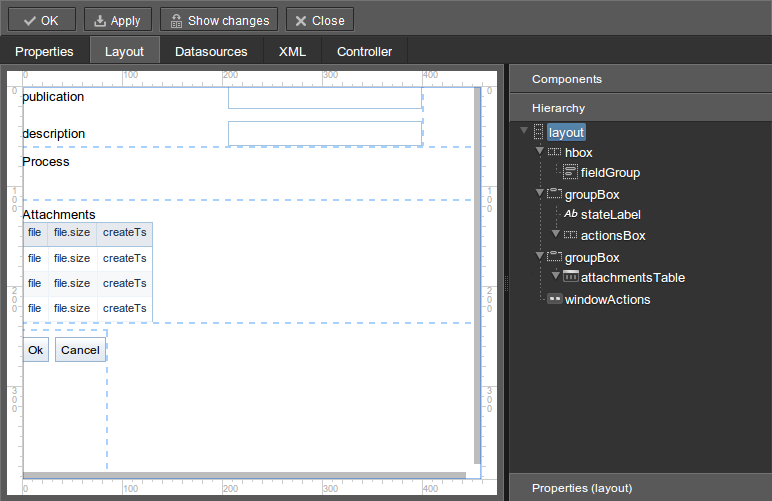 Select the line with the design in the Processes Design window and click Compile. If the compilation is successful, the Compilation date column will contain the current time. A new Proc object will be created in the application database along with the ProcRole objects that correspond to roles used in the design. A directory with the name proc_<date_time> (where date_time is the time process deployment) will be created in the process subdirectory of the Middleware configuration directory. This directory contains the following files required for process execution: jPDL, the forms descriptor, and the localized message pack. The jPDL file is sent to the jBPM execution engine, which creates the corresponding entries in the JBPM4_DEPLOYMENT and JBPM4_DEPLOYPROP tables. The jBPM process identifier is a string that is identical to the deployment directory name (proc_<date_time>). This identifier is also recorded in the jbpmProcessKey attribute of the Proc object. The process is ready for running. However, for the purposes of our example, we need one extra preparation - assigning default holders for process roles. Apart from the roles explicitly specified in the design, the system has created the CARD_CREATOR role with the Assign to creator attribute. This role can be used to allow the user who created the card to become a process participant automatically. This role is not used in the described example. It is recommended to set the process Code attribute to some meaningful unique value, since in the software code this attribute helps easily locate the process that should be run. In this case, set the value to book_scanning. The ability to migrate incomplete process instances (in other words, active cards) for the new process schema is verified. A new proc_<date_time> directory is created, where date_time is the process deployment time. A new process description with an identifier that is equivalent to the name of the deployment directory is created in the jBPM execution engine. This new identifier is set in the jbpmProcessKey attribute of the Proc object. To update the process in accordance with the changed design, uncheck the Create new process checkbox during design deployment and choose the process to be updated from the Existing process drop-down list. In this section, we will adjust the browser and editor for the EBook entity so that users can work with them in accordance with the business process. The basic logic associated with the process is implemented in the EBook editor. Let us start with revising the view that is used to load the EBook entity in the screen. Return to Studio, find the eBook.edit view in the Entities section of the navigation panel and open it for editing. Select the _local value for the Extends field, which means that the current view will include all non-reference entity attributes. In addition, include the proc attribute and set the start-process view for it in the View field. Below are the new screen elements. The description field of the fieldGroup component displays the value of the description card attribute. label with the stateLabel identifier shows the current state of the card. Inside the hbox container with the actionsBox identifier, we will programmatically create the buttons that allow the user to select an output of the assignment, or, in other words, an action for the process. The attachmentsTable table is used to show attachments that are created by the operator at the Scanning stage of the process. The table is linked to the attachmentsDs datasource. Below is the explanation of the controller code fragments. The postInit() method is called after the screen is initialized and the EBook instance is loaded with the view specified in the XML-descriptor (in this case, it is eBook.edit). When the EBook instance specified in the screen is loaded, the application verifies whether this instance is new or retrieved from the database. In the first case, the control is passed to the initProcess() method, which prepares the card and the screen for the launch of the new process instance. Below is the initProcess() method. The methods below initialize the buttons that correspond to possible user actions on the process, and the attachments table. The attachments table is a standard Table component associated with the attachmentsDs datasource that loads CardAttachment instances related to this card. In the table, a column is generated for the file attribute, which provides the ability to download the attachment by clicking the filename. The column cells display the LinkButton component, which invokes the corresponding file download on click using the ExportDisplay interface. Let us update the views that are used to load the EBook instances list into the screen. Find the eBook.browse view on the Entities section of the navigation panel and open it for editing. Include the proc, state and description attributes. For the proc attribute, set the _local view in the View field. description and locState have been added to the columns list of the eBookTable. These attributes provide the description of the card and the localized name of the current state. create and edit have been removed from the list of declaratively created actions in the eBookTable table. The corresponding buttons in the buttonsPanel have been kept because we will programmatically create these actions in the controller code. The standard CreateAction and EditAction are added to the eBookTable table in the init() method with an overridden afterCommit() method that is responsible for refreshing the table datasource. This allows displaying the altered state of the card in the table immediately when the changes are saved and the process moves on to the next stage. The CreateAction and EditAction standard actions do not reload the datasource after the opened editor is committed; they receive the saved entity instance from the Middleware and simply substitute it in the datasource for the original. In our case, it is necessary to reload the entity from the database because the process is launched in a separate transaction after saving the edited EBook instance, and the state of the card is changed at the same time. In other words, the EBook instance, which has not yet been changed by the process, is returned after the editor is committed to the datasource. It is necessary to reload the entity from the database in order to display these changes. Launch the server by clicking Run -> Start application server and log into the application as admin. Now you can simply save the card by clicking OK or immediately start the process by clicking Start process. 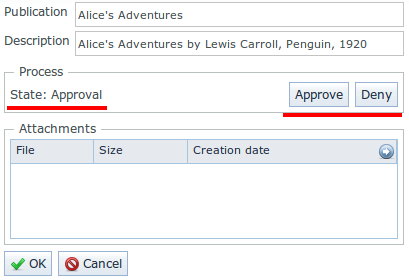 After the process is started, the editor will close, and the table will show the Approval value in the State (loc.) column. This means that the card is awaiting approval by a manager. If you now open the card for editing, you will see that all input fields are disabled, and none of the process actions are accessible. The same screen can be accessed in the usual way by selecting a row in the browser and then clicking Edit. When you open the card for editing, you will no longer be able to change anything or continue the process, since the next action must be performed by the operator. Click Open in this screen, or go to the Library -> E-books screen and open the card for editing there. You will see the available process actions: Success and Fail. Let us assume that you have completed the book scanning process as the operator. Click Success. You will see the transition form that was specified in the process. 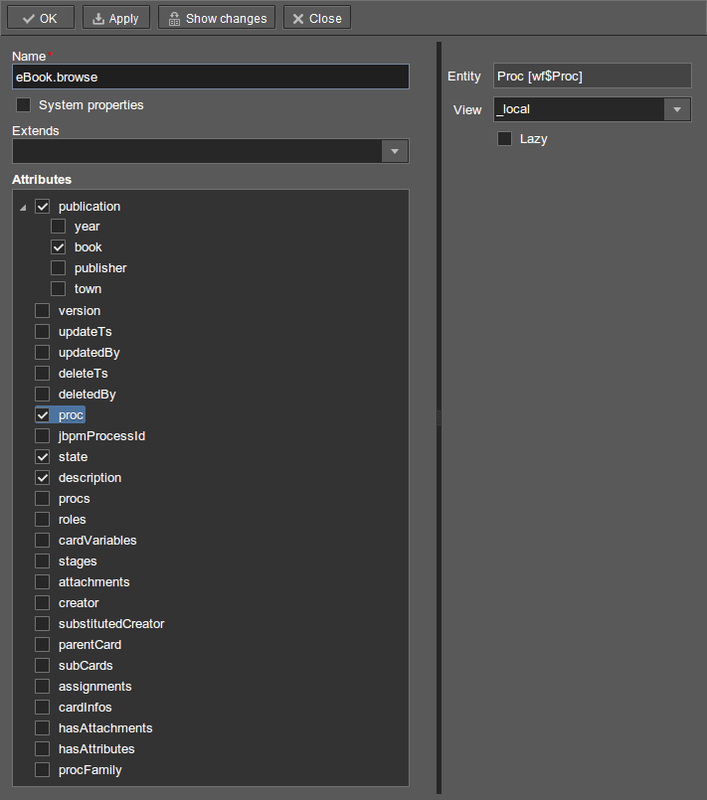 This section lists the application properties relevant to the Workflow subsystem. File path to load the visual designer host-HTML file, relative to the URL of the web application. Used in the Web Client block.